The need to provide compelling digital experiences for the growing number of tech-savvy customers in banking will drive the adoption of open banking application programming interfaces (APIs), predominantly in the payments and lending areas, according to GlobalData, a leading data and analytics company. In 2018, European banks entered into a new era of transparency as regulations such as the Revised Payment Services Directive (PSD2) in the European Union and the Competition and Markets Authority’s (CMA) Open Banking in the UK came into force with a mandate for banks to share customers’ data with their consent to non-banking third parties. The favored method of sharing banking data is through APIs, which are sets of instructions that can build connections between the products/services of a bank and a fintech provider instantly. This has given rise to numerous third party providers (TPPs) with API revenue models already built into their business plan. Kiran Raj, Disruptive Tech Analyst at GlobalData, says: “With banks coming under pressure due to increasing costs, rapidly diverging consumer patterns and evolving regulations, and fintech providers realizing that banks are the best means to win trust and distribution, their appetite for collaboration is growing. 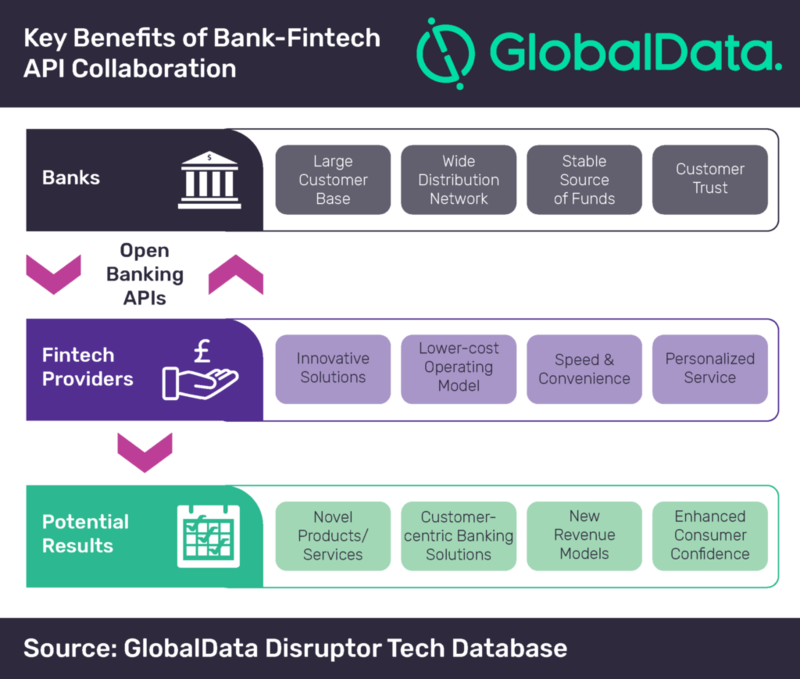 An analysis of GlobalData’s Disruptor Tech Database presents some interesting stories of API collaboration between banks and fintech providers under the open banking regime. San Francisco-based Token.io became the first licensed payment initiation service provider (PISP – a type of TPP) to complete an end-to-end transaction in June 2018 via the Token network using Santander UK’s API payment initiation endpoints. Token supports a single API that networks with the variations in APIs that banks have. London-based iwoca has grown to be the first business lender to connect with all of the UK’s CMA9 banks under open banking. iwoca’s API platform allows it to access the transaction history of a borrower’s multiple bank accounts to quickly and simply provide a loan. The downside to the open banking comes in the form of fraud and security implications for customer data. However, there are strong customer authentication (SCA) requirements that banks must adhere to and that will mitigate the threats of open banking. The governments in various jurisdictions have been using open banking frameworks as an accelerator to meet their specific goals. Beyond Europe, some of the popular open banking regulations currently in force are – Australia Treasury Open Banking and HKMA Open API in Hong Kong. Countries such as Brazil, Canada, Japan, Malaysia, Mexico and the US are also contemplating open banking regulations.